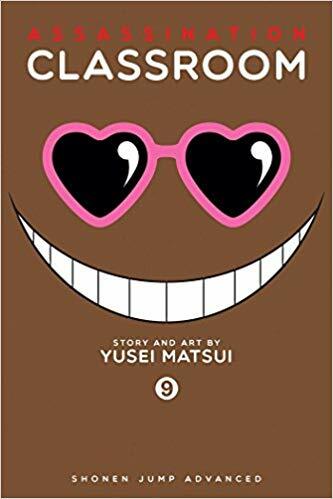 Assassination Classroom continues into its ninth volume with the conclusion to the quite literally explosive cliff hanger at the end of Volume 8. I found that the resolution was quite satisfying in some ways, but also a bit of a ‘cop out’ as they say, in others. I’ll leave you to form your own opinions about that. I don’t think it’s a spoiler to say that the tension which built throughout the last couple of volumes has now reached its climax and a lot of Volume 9 is about getting the characters back into the swing of their everyday lives. We’ve got the rest of their holiday (which is passed with various light-hearted activities) and then, after that, they head back to school and it’s essentially business as usual. Though it may not be as exciting as the volumes immediately preceding it, I think it was important to have an instalment like this, because after the intense, emotionally charged events that had just happened, we needed a bit of a breather. We appreciate the normality all the more, because we’ve seen the fabric of their lives threatened. What I like is that, by now, Koro-sensei has cemented himself as the whimsical, impish delight that he is, whose main and only concern is the wellbeing of the children. For me, he just becomes more lovable the more I see of him. I feel like I’ve said something similar in my review of every volume – but it’s so true. He’s such a well written character. While this volume may not have all that much of a cliffhanger, we’re left with the thought that time is running out and, no doubt, the hardships they face will only grow in the future… I’m looking forward to the next one!